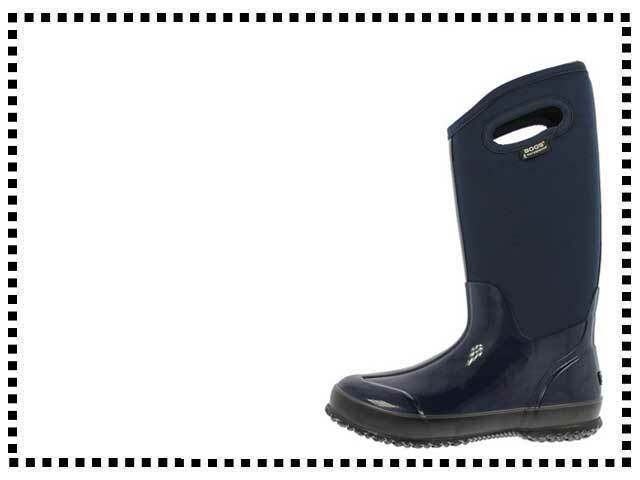 These Classic high handle women’s boots from Bogs are constructed from 100% waterproof rubber and neoprene. The boots are sturdy and durable but still flexible enough to keep the feet comfortable. The pull-on handles are a handy feature to make to boots easy to get on and off. Available in black, grey, blue, olive, chocolate and red. Maybe the best rain boots I have bought. They are really comfortable. I love the handles and the way they stretch. I wear rain boots often so I wanted a pair that would be very comfortable and these Bogs have not disappointed. Great boots, very comfortable. I love the stretchy material, it makes them fit perfectly. This is the second pair of bogs I have bought, I love them! Very nice boots but they seem to run a bit small, they do stretch, but I would recommend ordering a size up. Great winter boots. I got these for Christmas from my husband and they are super.